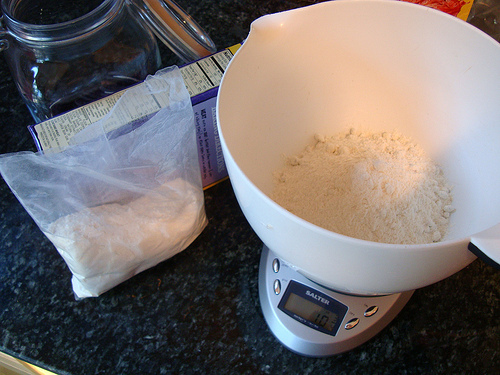 Using a scale to weigh your ingredients makes life So Much Easier. I think I may have discovered a new and easy mixing method, friends. As Spelled Out in the title up there, I’m calling it Dead Easy PMAT Method. You could call it DEPMAT, I guess, although that sounds kind of like some Governmental Agency that is headquartered Deep Underground in Nevada. Credit where credit is due: it is based on the Two-Stage Mixing Method, popularized by Queen Rose Levy Beranbaum. If you’ve not been to her blog, go there. 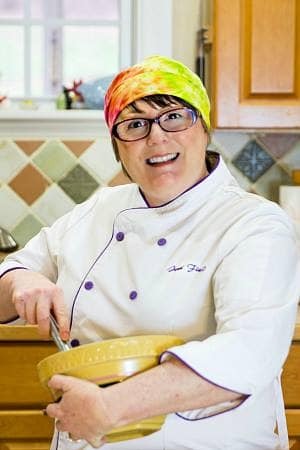 She is, arguably, one of the most accessible of the Big Dog Bakers out there. In the bowl of your trusty stand mixer, whisk all the dry ingredients (flour, leaveners, salt, sugar, cocoa [if making chocolate cake], any dry spices) together Very Very Well. Whisk all of the wet ingredients (eggs, milk/water/coffee/whatever, vanilla, other liquid flavorings) together in a large pitcher. Whisk them really well so the eggs don’t just hang out down at the bottom of the pitcher. Make sure your butter is coolish and soft-but-not-greasy. Throw the butter in with the dry ingredients and mix until Somewhat Crumbly. This gives you the tender portion of your cake–coating a lot of the flour with straight-up fat will prohibit Undue Gluten Formation. You actually have a little room to play here. More mixing at the stage will give you a Very Tender Cake. If you want to maintain structural integrity, mix until butter is well incorporated but the mixture hasn’t gotten clumpy and cookie dough-looking. Pour in 1/3 of the wet ingredients. Start on low, and then mix and mix on medium for about 1 minute. Scrape bowl as necessary. The addition of the liquid (milk/water/whatever) in addition to the water in the egg whites and Serious Agitation allows for some gluten to form, making sure your cake doesn’t Fall Apart from Too Much Tenderness. Add the next 1/3 on low and mix until just blended. Ditto with the last 1/3. Scrape the bowl, then crank the mixer up to medium for about 3 seconds to make sure everything is Homogeneous. Mix in 1/3 of the wet and beat for a minute or so. Mix in the rest of the wet in two additions. By the way, Rose’s chocolate cake mixing method has you boiling water and stirring in cocoa and cooling it and Futzing About. I’ve done it that way, and I’ve done it my easy way. Results? Pretty much identical. So, if you’re wondering if you really have to Boil Water and Stir and Wait when really all you want to do is to put cake in your face, the answer is No, you don’t. You’re welcome. Should I have experimented with an Unknown (to me, anyway) mixing method while making a wedding cake? I say Yes, since I had Science to back me up. I wasn’t just shooting in the dark, so I felt confident that I would get the results I was aiming for. And I did, so yay me. And now I’m telling you guys, so Yay Everyone! I just found your website….I love it! Will your tips for cake making work for cupcakes? I’m really trying to get moist but light cupcakes. What method would you use to produce really moist and light cupcakes. My cupcakes are coming out some what moist but very dense. HEEELP! LOL! What does PMAT stand for?